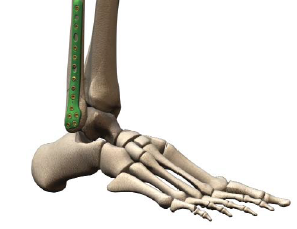 The ankle is a hinge joint comprised of 3 bones: (1) the shin bone, tibia; (2) the other bone of the lower leg, fibula; and (3) the ankle bone, talus, at the top of the foot. Most ankles are fractured or broken (the terms are interchangeable) by a twisting force. The broken bones may still be in the correct place (called an undisplaced fracture) or out of place (called displaced fracture). With fractures, the ligaments that normally hold the ankle in position may also be damaged. The ankle joint maintains stability and provides mobility – if it’s broken, it may not perform either of those critical functions. Left untreated or not properly repaired, even small fractures may lead to arthritis in the ankle. Not every fracture needs to be operated on. Some can be realigned by manipulation and then held in position with a cast only. Whether or not you have surgery, you will require a period of immobilization to protect the fracture: up to 6 weeks without bearing any weight on the fractured ankle. People often experience pain, stiffness, weakness and swelling at the ankle due to the immobilization period. It is important to begin progress toward regained mobility as soon as possible. Your surgeon will discuss rehabilitation and may recommend physiotherapy as the first step. It is not uncommon to permanently lose some motion of the ankle after an ankle fracture, particularly in an upward direction. Fortunately, most people are capable of attaining a functional range of motion, which means that you are able to perform most activities after having attained complete recovery. As the swelling improves after surgery, the plates and screws used to fix the fracture may become prominent and rub on your shoe. If this is the case, they may need to be removed. Otherwise, the plates and screws can be left in place for the rest of your life. Although most people recover completely after an ankle fracture, some develop ankle arthritis, depending on the severity of the fracture and cartilage damage at the time of the injury. Each fracture is different so you should talk to your surgeon about your specific fracture and what you might expect long-term.